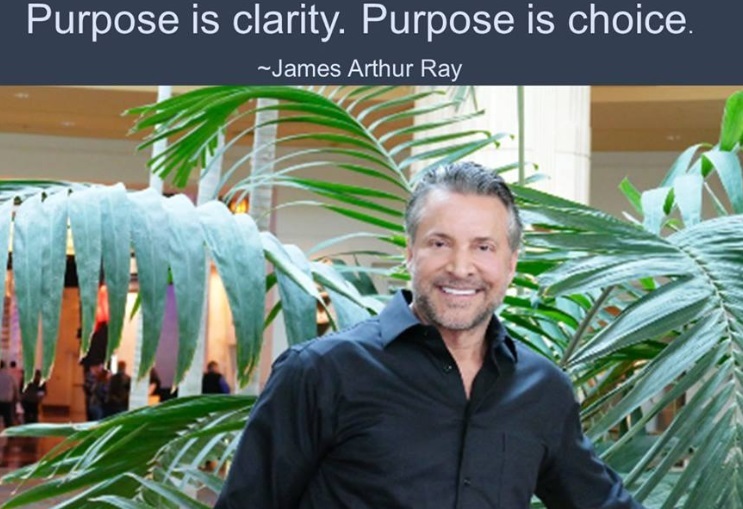 James Arthur Ray is considered one of the world’s foremost leadership and performance advisors, coaches and consultants. He began his career consulting with C-Level Executives at the AT&T School of Business. It was here that he realized his purpose for helping others find their unique gifts, and then leveraging them to take their life and business to new levels. His company hit The Inc. 500 in 2009 as one of the fastest growing privately held companies in the United States. James was featured in the film documentary “The Secret,” a ground-breaking feature-length film, and New York Times bestseller. He is the author of the New York Times Bestseller Harmonic Wealth: The Secret to Attracting the Life You Want which focuses on his principle of Going Three For Three: how to effectively bring your thoughts, feelings and actions into harmony with bold application. James states vision without bold action is a total waste of time. I studied Applied Behavior Sciences in college and cut my eye teeth at AT&T School of Business consulting C Suite Executives. I’ve always been interested in powerfully leading both your life and business; and the strategies of leadership performance. I built my life first, then my business, then I began assisting others to do the same. Forbes predicts that 50% of the payroll jobs are going to be gone in 10 years or less. Even if their prediction is aggressive, the market is changing rapidly. AI’s are going to displace many. Reinvention and adaptability are paramount in today’s world. It’s hard enough to reinvent yourself in your 30’s, much less your 50’s, but this is what we all must commit to. There is nothing in my opinion more important than this. We must all learn how to be happy in the midst of disruption and apparent chaos. I believe that really finding and following your purpose versus a paycheck to be critical to this outcome. Someone commits suicide every 16 minutes in the United States, yet no one is talking about it. The largest crises we have is not environmental, energy or economic, it’s a crises of meaning. I think our greatest opportunity, as well as challenge, is the ability to live longer. For every year we stay alive, science now is discovering a way to give us one more year. If you live long enough you can potentially live forever. The implications here, both exciting and disturbing, are vast. We must consider population, food, shelter, overcrowding, traffic, jobs with increasing AI. Maybe most importantly, happiness and fulfillment. With more deaths by suicide each year than by terrorism, war and crime combined, we need to be looking at how to address this issue. The answer resides in a shift in core values, mindset, and meaning. I believe that we are all born to be true leaders of our own life. Irrespective of our title, position, salary or popularity. When we develop the Self-Awareness to know who we are and then live it, we live fulfilling lives. We have our rightful place in this universe. We take our power back and have dominion of our lives. There’s no guarantee that you’ll be “successful” by worldly measures, but you can be guaranteed a meaningful and fulfilling life. The ultimate objective of all leaderships, entrepreneurship, spiritual teachings, and personal performance is to help man comprehend and own his rightful place in this universe and to access and utilize his full power and right to dominion. This is my prime objective for all individuals and businesses. Self-Awareness and Self-Expression; and facilitating this shift is the vision for my business. To mold and develop leaders willing to sacrifice for a cause far beyond their own needs. My new book The Business of Redemption, The Price of Leadership is planned for 2019 release. Our 5 Day Leadership for the Future experience is in full swing with attendees from all over the world including Finland, UK, Canada, as well as many other countries including the United States; and our 2 day Mental Mastery and Power experience is scheduled for October. Finally, The Prometheus Academy of Leadership and Business Acceleration is certifying life coaches and business consultants from around the globe in the philosophy, psychology and strategies listed above. The most profitable initiatives we have to date are my Executive Coaching, Leadership for the Future and Prometheus Academy. It’s always difficult and frightening to make decisions based upon where you’re going versus where you are. Particularly when the money doesn’t appear to be there. Making big bold moves is critical to growth. I’ve learned that when you know who you really are, when you know your purpose, you focus on contribution, value and increase for others, and you move boldly forward, you meet with uncommon success. Unleashing their unlimited potential, overcoming fear and hesitation and taking their power back. Instead I help them find their Powerful Transforming Purpose (PTP). When you find your PTP you don’t need motivation. Motivation comes from outside. Inspiration comes from inside. I prefer to inspire and ignite through clarity of PTP and values. My gifts are in seeing a future that others cannot yet see. I see that greatness in others that they cannot yet see. I’m great at research, development, delivery and direction. I see the infinite potential in all humanity whether we currently exhibit it or not; and I’m good at helping them access it, utilize it. and take their power back. I’m crystal clear on my purpose, why I’m here, and the gifts I’m given to contribute to the lives and businesses of others. I don’t attempt to do everything. I’m committed to mastering my One Thing. I’ve taken many hits but it’s hard to stop someone who never gives up. My clarity and love for my mission bring me the grit, mental toughness, and emotional strength to continue. I’m here to impact, influence, guide and direct the infinite potential and the destiny of the entire human race. My Magnificent Obsession is to positively impact a minimum of 1 Billion people worldwide. While I’ve been blessed with hitting the Inc. 500, becoming a NYT bestselling author and many other achievements for which I’m eternally humbled and grateful, I believe my greatest success is developing enough Self-Awareness to know who I am irrespective of the rises and falls of business, life, and the opinions of others. It seemed that it would have been much easier to go away and not continue but fortunately my purpose and calling (versus career) would not allow that to happen. The choice had already been made, my job was to figure out why? What I will to be I will be. Most anyone who has faced tremendous odds, major ups and downs, and yet continued with their individual calling: Leonardo da Vinci who was the illegitimate son of a pauper, never had one single day of formal schooling, yet went on to become a genius, Vincent Van Gogh who only sold one painting while alive but continued; and left 900 masterpieces upon his death, Elon Musk who put his entire $180M from PayPal into SpaceX, Tesla and Solar City; and had to borrow money to pay rent, Steve Jobs who was ousted from Apple, the company he built, but refused to quit, Martin Luther King for his visionary commitment no matter what, Nelson Mandela who sacrificed and paid the price for his belief; and thereby changed the world, Mother Teresa who fought self-doubt and even lost her faith and belief in God for time yet continued; and many others. The greatest souls have always, and will always, experience the greatest suffering. My favorite products are books and movies that inspire and make me think. We tend to forget that the word “passion” is Latin for “suffering.” True passion is the willingness to sacrifice, and yes suffer, for a cause that’s far beyond your own personal needs. In my mind and experience this alone is true leadership.